With the Prophecy Les Paul Custom Plus EX, Epiphone presents a modern interpretation of the legendary Les Paul, suited for all shredders and metal heads. Equipped with 24 Jumbo frets, the rosewood fretboard of the Prophecy Les Paul Custom Plus EX offers two octaves for masterful solos and complex riffs, which fly from your fingers thanks to the flat 14” radius and the comfortable “Slim Taper D” profile. Two high performance humbuckers from the EMG house ensure for plentiful, assertive sound. The 81 in the bridge position impresses with present mids and spicy highs, even with extreme down-tunings and presents every riff with articulated attack. The 85 in the neck position is slightly more moderate, yet still powerful and impresses with singing solos and fat rhythm sounds. The LockTone Tune-O-Matic bridge guarantees perfect intonation and string action, even when the guitar is tuned significantly lower, while proven Grover Rotomatics ensure for unshakeable tuning stability. The Epiphone Prophecy Les Paul Custom Plus EX is also available in Midnight Ebony. Satisfied in every way. What you see is what you get, even better. The colour looks awesome in reality. The emg pick ups sound amazing and the guitar lies smooth in your hand. Very good for some serious shredding caus of the thin neck. The guitarcase including was a pleasant surprise. Apart from the scratches in the finish that it came with it is a wonderful guitas. The satin finish in the neck makes it very smooth to play and very fast too. The tuners are great, and the pickups are EMGs, so there is no need to talk about it. Resuming, it is a great guitar, just a little bit heavy, like any les paul, but it is just so good looking and amazing to play that you dont eve care about the weight! The sound is just perfect, for me anyway. 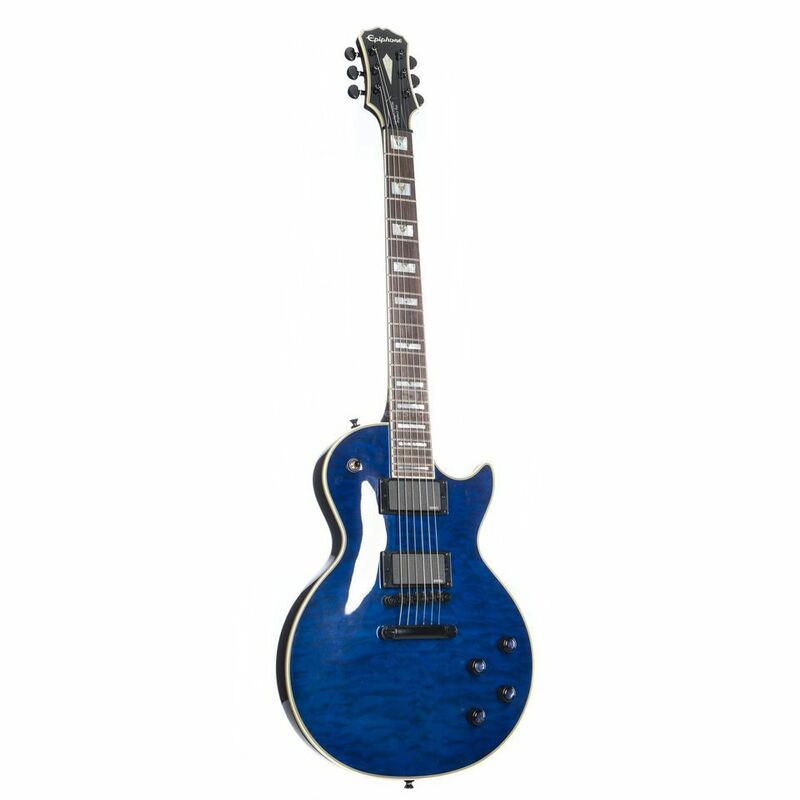 I play lots of fast, heavy, low-end metal and this guitar by Epiphone is amazing for what I do. Overall this guitar is really amazing. If your a serious guitar player I cant see how you would disslike this product. This is the first guitar of mine that I really really enjoy everytime i pick it up, and find that its hard to put down. If you have a chance to play one you will see my point.